Custom Boat Graphics work includes the chance to see what you’re getting before we produce it. A process we call “Virtual Relettering”® This level of service commands best practices by real artists who love boats. Registration numbers and hailing port are included at no extra charge. $250 Design Deposit covers one to eight iterations of virtual previews. Typically we start with four and narrow down the choices approaching the eighth iteration. $75 for the next one to eight ideas. 1st drafts are usually posted in a few days upon receipt of your payment. This personal web page includes your name 66 ways, then our best efforts to create an outstanding logo given your requirements. Please check as schedule varies seasonally for custom illustrations. Balance due will be based on the size of the final graphic and the materials we use. 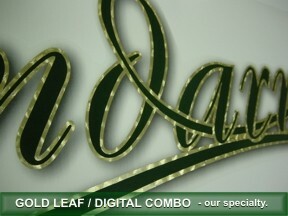 A graphic that uses real gold leaf will be more expensive than silver, then digital prints, then cut vinyl in that order. Installation, if that is an option also varies on a case by case, please inquire. Let us know if you’ve got a cruising date you don’t want to miss. This is a drop dead date we can prioritize with. Order early and avoid the seasonal rush? Payment is due after you choose your favorite idea covers Production, Shipping/Handling of said graphic. We replace graphics damaged during shipping if the damage prevents a normal installation. If you mess up during install we will replace at a discount. A photo of the damage emailed in advance of your return package will expedite production. We archive original art forever for your next boat. Please email dimensions and photos to info@marinegraphics.com with your contact information. Custom Gear previews included at no additional cost when you purchase an item. In addition to cups and gear we can prepare your graphics for embroidery through a completely new service network. Already have your design finished to scale?